WHEN it comes to real estate, it’s all about position, position, position. Bundaberg was one of the hardest hit Queensland towns when floodwaters virtually drowned the town and ripped houses from foundations, but somehow Bundaberg Golf Club escaped serious damage. The golf club’s general manager Greg Hills said the club was extremely lucky to escape with minimal damage. “We fared pretty well,” he said. “We were flooded from the rainfall, not the floodwaters. “We lost sand out of the bunkers and the course superintendent lost the club’s ute, which was in his shed at home when his house was flooded. Hills said the golf club survived the floodwaters because it’s positioned on high ground in Bundaberg North. “It always floods down the bottom end of the course away from the clubhouse and work shed, but the water drains away quickly,” he said. “We were very lucky. 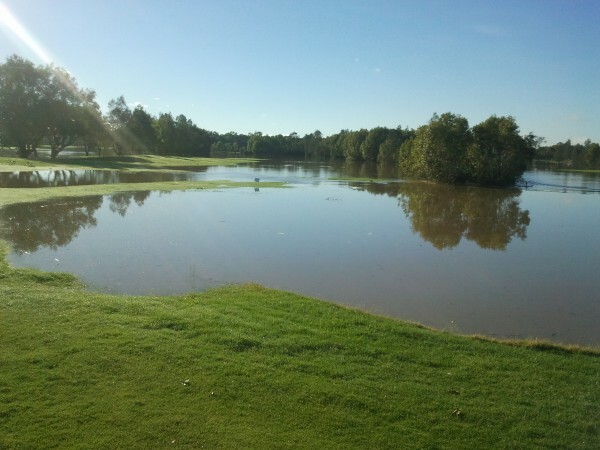 AS the floodwaters receded, Maryborough Golf Club was left to count the cost. “We got a fair bit of silt across the golf course and had seven holes out of play for the first couple of days,” said the club general manager Paul Brays. “We still have bunkers GUR – some of them had three inches of silt in them. “We pumped water from a natural water hole that runs around the side of the course on three of the holes. “That water was used to wash the silt off the greens because our irrigation pumps were knocked out and are still not reconnected. “Everything went under including the fuse box. “We are yet to assess all the damage to the greens and bunkers. “We had one tee (box) subside and has dropped a fair bit so there is work to be done there. Brays said he believed the damage bill would easily exceed six figures. “In 2011, our damage bill was $97,000 when we had damage to 16 bunkers and this time 27 bunkers washed out – not to mention all the other damage. Brays said it was a huge blow to the club. “The club was travelling okay after a couple of good trading months in December and January,” he said. “But every time you close for a week you lose $15,000 in income straight away. You still have to pay wages and all the other bills. A TORNADO ripped through the coastal town of Bargara tearing the roof off the bowls club, but the golf club, a kilometre away, was virtually untouched. “If you want a good luck story, I have got one for you,” said the club’s general manager, Geoff Peard. “We copped a tornado in the middle of the town that took the roof off the bowls club. “The tornado went up the 12th fairway and took out a huge tree, but apart from that the golf club lost power from 1pm on Saturday to 6pm on Sunday. “Our sixth fairway goes under quite quickly so it was a lake for two days, but 75 per cent of the golf course is built on sand so we were playing golf on Tuesday and by Thursday we had carts on the course. “Our volunteers did a magnificent job. They picked up all the tree limbs and cut up the uprooted trees. “That allowed the superintendent and his staff to concentrate on the fairways, greens and bunkers. THE Rockhampton golf course resembled a fish market after the recent floods. 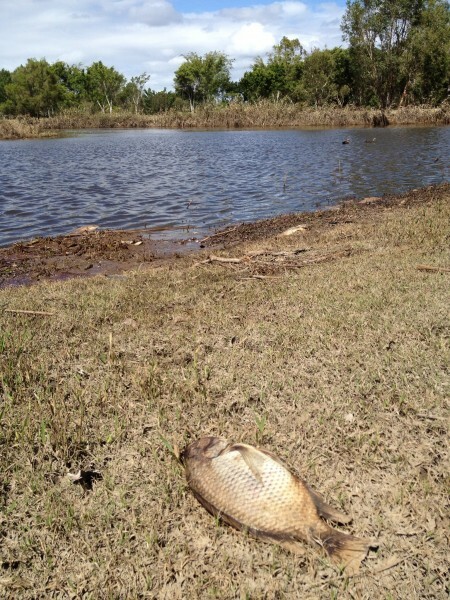 According to club professional Ian Collins, the floodwaters wash “truck loads” of fish including barramundi, bream, catfish, garfish, perch and yellow belly onto the golf course. “The staff and volunteers worked pretty hard to remove the dead wood and fish,” Collins said. Collins said floodwaters hit Rockhampton twice in a couple of weeks. “We got that heavy rain at first and then a week later got everybody else’s rain,” he said. “It takes a couple of weeks for the water to come from out west and up north down the river systems. “We had 18 holes open for one day before the second deluge arrived. “We had 822mls in two days. That’s a lot when you consider the average annual rainfall for Rockhampton is 908mls. 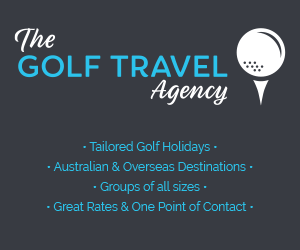 CAPRICORN Country Golf was one of the worst affected golf clubs in Central Queensland. The club’s secretary Delliah MacGillvray told Inside Golf the estimated damage bill to the golf course and clubhouse would be more than $36,000. “We had eight greens, five tees covered with water and silt so we have had a fair bit of damage,” she said. “We lost our irrigation pump station and also had water in the clubhouse. UNLIKE near neighbours Rockhampton and Capricorn golf clubs, Yeppoon Golf Club escaped virtually unscathed. Wendy McCosker, the club’s general manager, said the only damage was to trees and bunkers. Our club fared fairly well considering the damage to the other courses,” she said. “We had hundreds of branches and a few trees down, but we had a three-day working bee and managed to get the course up-and-running quite quickly. “We just want to give them a helping hand,” McCosker said. THE last thing Ipswich Golf Club near Brisbane needed was another damaging flood, especially after the 2011 devastating floods. General manager Steve Day, who only took over the reins mid-December, said there had been significant damage to the golf course and some infrastructure. “We had a fair bit of water over a number of holes, which caused a lot of damage,” he said. “We lost four pumps and the electrical boards that run it. “A couple of bridges were damaged and will have to be rebuilt and there are still a number of bunkers out of play. Day said the damage to the golf course and infrastructure would exceed $100,000. “We were just starting to claw our way back and then we get something we didn’t need,” Day said. “It’s just another challenge, but we are determined it’s not going to beat us. “It’s a good club with some fantastic members. The membership base is growing so we are hoping to get through it. VOLUNTEERS came to the rescue when Mt Warren Park golf course flooded recently. “We had a good crew of volunteers who came in the next day to hose silt off the greens,” said the club’s assistant professional Anton Booy. “There was two or three metres of water in some places, but with the help of the members (volunteers) we were back playing 18 holes with carts quite quickly. “A lot of the bunkers were lost when the sand was washed out and we had some water through the greenkeeper’s shed and the pump house. “Considering the damage to other course, we aren’t too bad. THERE were reports of deadly bull sharks moving in on Riverlakes Golf and Country Club near Brisbane. What did turn up was plenty of dead fish and eels. Still, the golf course received damage when the river burst its bank and left quite a mess. “We have lost $50,000 in revenue from the events of the Australia Day long weekend,” Paynter said. “That doesn’t include the repair costs. Mid-February, there was still a significant amount of mud on some fairways. In January, the club had to turn on the town water to feed the greens and tee boxes. “Prior to the floods, I was scratching my head wondering where the water was going to come from,” Paynter said. “I had to turn on town supply to irrigate our greens and tees. A few days after the water subsided, Riverlakes opened six holes for play and within two weeks had all 18 holes in play. “There are certain holes that look really good. but others look like a disaster,” Paynter said. HAVING a 27-hole golf course is attractive to golfers but when natural disasters like floods occur, it can mean a bigger clean-up bill. That’s exactly what happened to Logan City Golf Club. Club director Carl Evans said 23 of 27 greens went under water and there was water across 26 holes,” he said. We have had two weeks without turnover and that has cost the club around $80,000. “Damage to the golf course alone will be at least $100,000. Once we have assessed all the damage and loss of revenue it will be around $200,000 all up in damages and turnover loss. Evans said the club was working overtime to repair the damage. “We don’t know how the greens will fare in the next few weeks. Obviously, we will renovate the greens. We have to treat for fungicide, then fertiliser, core scarify and sand the greens to make sure they survive. At the time of going to press, members were playing an 18-hole composite course. GOLF Queensland CEO Lindsay Ellis told Inside Golf a number of other clubs that had reported significant damage. 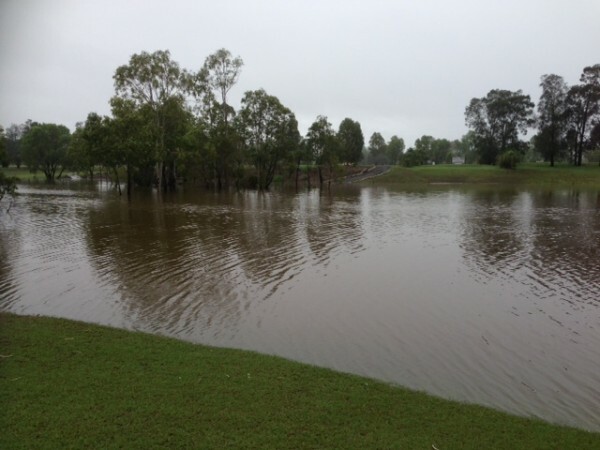 Mundubbera GC – three greens and four fairways flooded, irrigation/sprinklers destroyed, debris on course. CARBROOK Golf Club’s general manager Scott Wagstaff was a little concerned when floodwaters arrived and virtually flooded the golf course. Damage to greens and fairways was a major concern, but the thought of losing the bull sharks that reside in Shark Lake was, well, worrying. In fact, so worried was Wagstaff that he posted a tongue-in-cheek advertisement on the club’s Facebook page. It read, LOST. One pet bull shark, approximately eight feet in length, grey in colour and answers to the name “Greg”. May bite … reward offered. At the time of going to press, there hadn’t been any sightings of “Greg” or the other sharks. “We haven’t found the sharks yet because you can’t see in the water,” Wagstaff said. “It’s just muddy at the moment so there is no visibility. “I’ll wait until it clears up and go down and see if they are still there. According to Wagstaff, the sharks washed into the club’s main dam when the Logan River bust its bank and flooded the golf course in 1996. “Since then the sharks have been landlocked and have grown up and bred in the healthy ecosystem that now exists,” he said. “It has been a great source of publicity and marketing for the club. In recent years, there have been more than 2.2 million YouTube views of the shark video at http://www.carbrookgolfclub.com.au/sharks.php. They have even had hits from Pakistan. The Logan and Albert rivers meet at the end of the golf club’s property and the extensive flooding caused by both rivers is equal or worse to that experienced in 1996 – the area’s last major flood event. “The floods seriously affected three holes (10th, 11th and 12th), which are on the river,” Wagstaff said. “The rest of the course recovered beautifully so that’s positive. Wagstaff said the clubhouse and maintenance sheds were unaffected. “We were pretty lucky in terms of infrastructure damage,” he said. “It was just the three holes near the river that got a bit of a smashing. Two greens went under waters and they have recovered quite well. Carbrook Golf Club now has 18 holes open for play.